On Sunday night New York Red Bull and Los Angeles FC have met at Red Bull Arena. They performed an interesting battle which ended up a 2-1 victory for the home side. Of course, both teams had an intention to win, but the reason for this needs is a bit different. NYRB has been in good shape, they won their last 4 out of 6 matches. However, in the last round, they recorded their second home loss in this season with a 2-3 against Columbus Crew SC. While LAFC has been in a quite bad streak with only 2 victories out of their last 6 games. Especially, if we look into their last 3 games, where they had 1 lose and 2 draws. One of the draws was particularly painful due to the fact that was against the LA Galaxy. In that derby they conceded a late goal – same happened in this match against NYRB. So, both teams came to this match with an aim to win, which was a good sign for the fans before the match. Another pro for watching this match was in connection with the players because both of them have a great pair of attackers. Wright-Philips and Kaku against Carlos Vela and Adama Diomande. These two pairs had the exact same scored goals in a combine. Philips (14) and Kaku (3) had scored 17 goals in overall until this match and Vela (8) and Diomande (9) also had 17 goals. Moreover, these two teams usually have goal-heavy matches due to their stats that shows both of them score at least 2 goals in every game. However, New York Red Bull only conceded 22 goals in 21 matches, which is around 1 goal per match. While LAFC has almost the same amount of scored goals (42 – 44), but they had much more conceded goals then NYRB had. 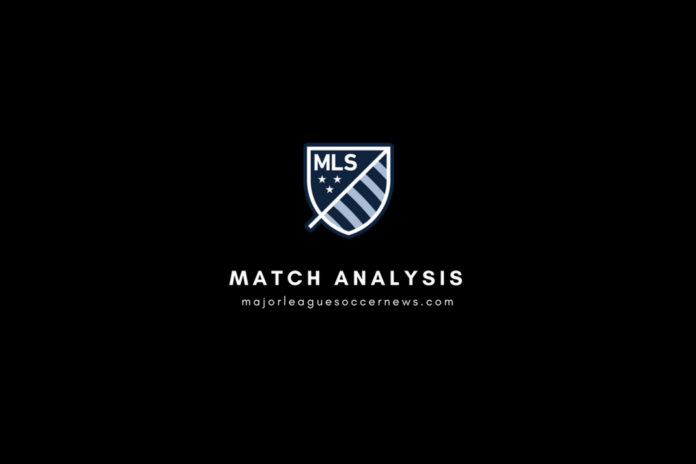 Los Angeles FC conceded 35 goals in 21 matches, which is an average 1,7 goal. That’s showed exactly what is the biggest reason for the flimsy season and their biggest weakness. Both teams had a habit to use long air balls like volleys in order to reach the final third. 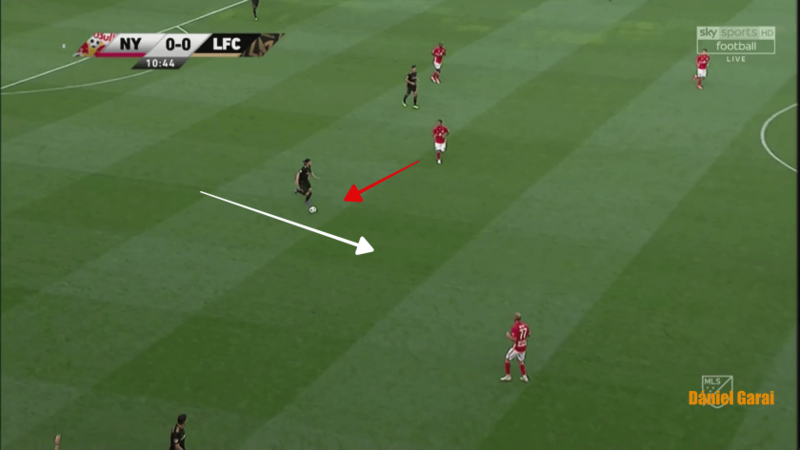 It is easier to use volleys instead of outplaying/beating the opponent’s midfield, however, the airballs have the nature of losing the possession more easily due to the fact that these are lower percentage passes. In addition, the fairly lot of mistakes that they performed resulted in a plenty of changes in possession, which kind of breaking the continuity of the phases. None of them had a proper way or method to break the opponent’s defence – unless volleys are counts – and create chances. It rather felt an ad hoc manner/style in their attacking games. This manner continued in the second half, but with a much more intensely. The game becomes some sort of transition game. Both teams when we’re on the ball tried to play quick to the final third most of the times with long balls (on ground or air), but there were mistakes in the execution. So, it was a common picture that one team after a few quick passes tried to pass directly to the forward players which pass got blocked one of the opponent’s players when they tried to perform a quick counter-attack, which also ended up with a stolen ball. 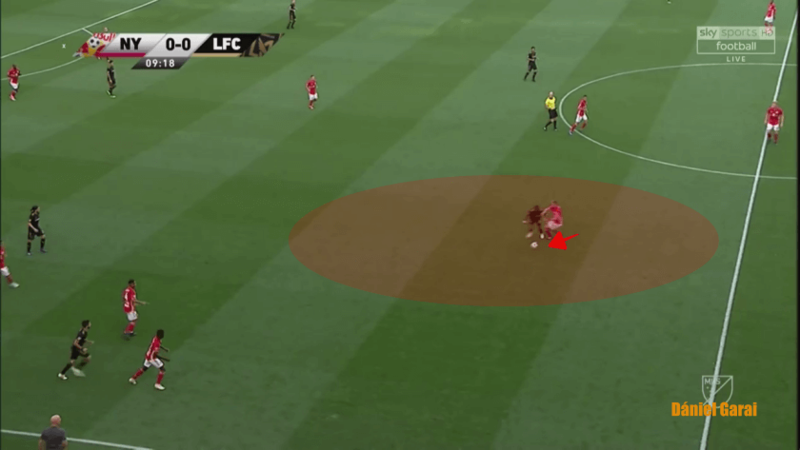 Another reason for the game became like that was the manner that both teams used in the defensive phase. After a vertical pass, the defending team quickly collapse on the ball as they tried to defend the situation and get the ball. 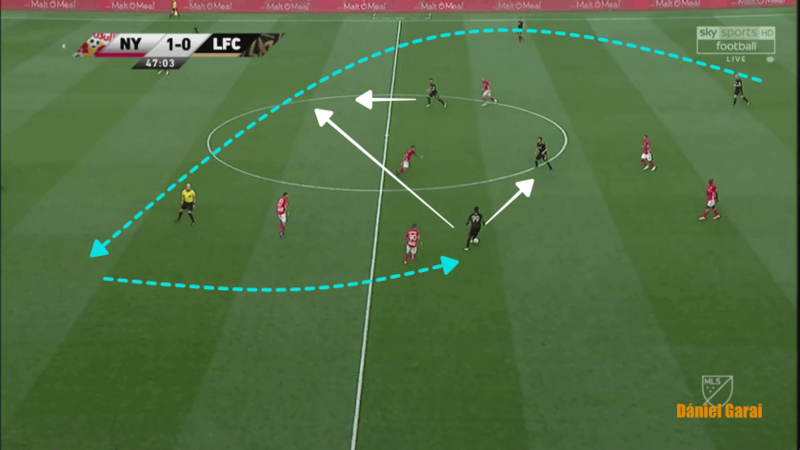 Furthermore, with the lack of real staggering, the passing lanes were open and this also encourages the teams to pass directly to the forward players. It also increased the chaotic flavour in this game. The guest also suffered from isolation. 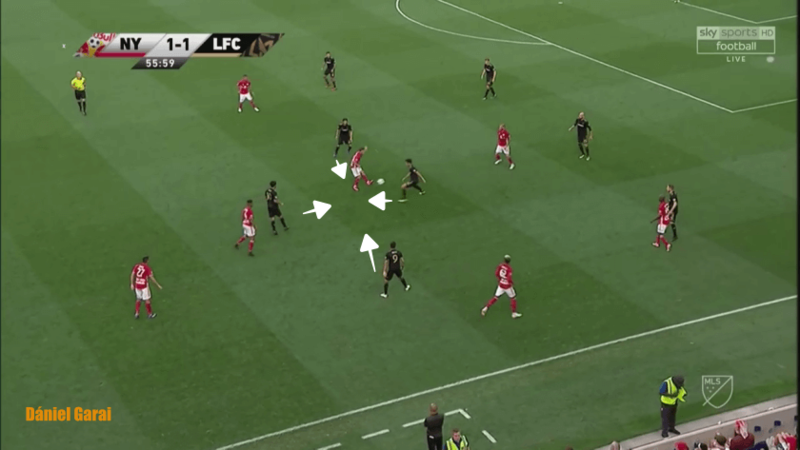 During the whole game there lots of instances when a LAFC player got the ball in an isolated position and without any support they struggled. Firstly, I show an early case, when LAFC managed to beat the opponent’s press. In the situation, Rossi pass to the dropped Diomande, who without any supporting movement, thus he had to beat the pressing and solve the situation alone. These also showed the man-oriented manner that NYRB used during pressing. Almost the same happened in the second half. The centre-back played to the dropped Diomande into the left halfspace via volley. As you may see, only two options had in this circumstances. Passing to the nearest teammate or realising the opportunity for diagonally he could reach the other teammate. It could be a pressing trap or it is? NYRB used quite plenty of energy to pressing, usually, participated with 3-4 players in high position. 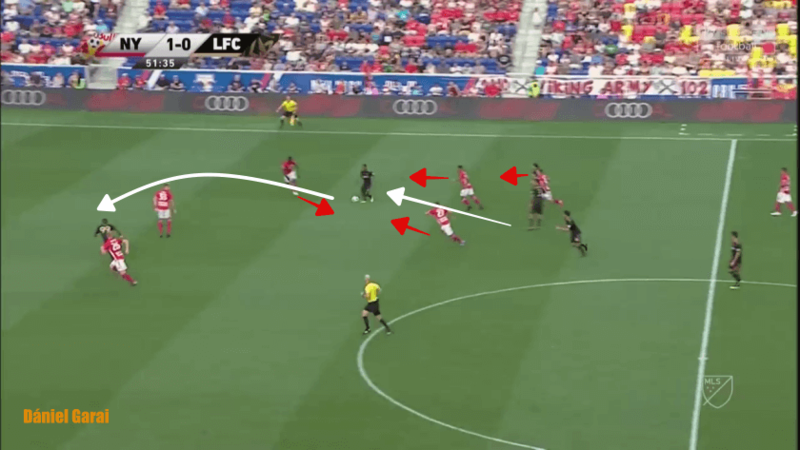 Nevertheless, NYRB was inconsistent while they pressing. In some situations were when they managed to execute the pressing quite well, but there were other when they did not. 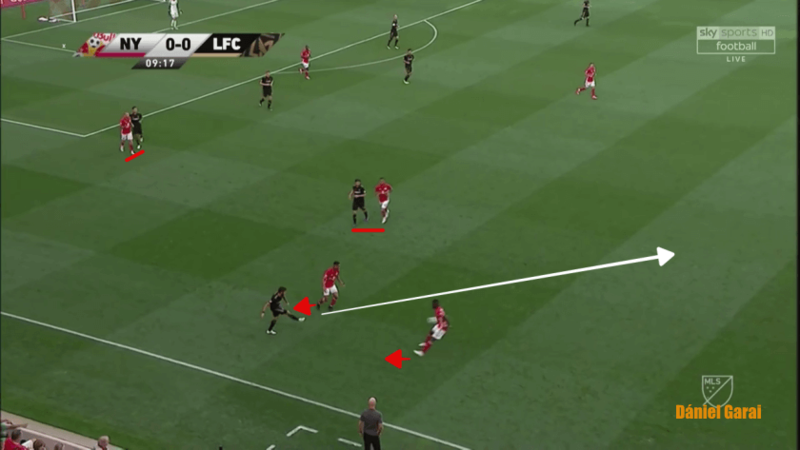 Firstly, they let the right centre-back or the deepest midfielder – Nyguyen – to progress upon the half-space. Then Kaku or Philips used a curved run to force the ball-carrier to the zone where they were in strong position. 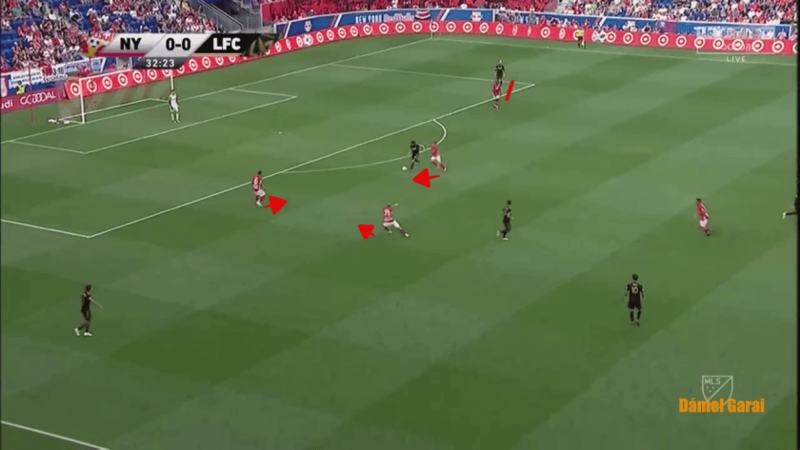 Usually, the midfielders and the fullback also shifted there in order to block the passing options and stopping the progress. This would force the ball-carrier for a turnover or give up the ball. In the first period of the match, NYRB had some flaws, like this one. After they forced the opponent for turnover (image above) Kaku did not cover his mark and letting the opponent escape the pressure. After the first 25 minutes NYRB became much reliable in pressing and constantly stop the opponent’s build-up, thus it became a big issue for the guests. In the first half, when the guests managed to bypass the pressing two pattern became in use. They passed behind the opponent’s defence directly towards Rossi in order to use his pace, however against him Lawrence was in that duty to defending, who also not a slow one, thus these weren’t the successful tries. 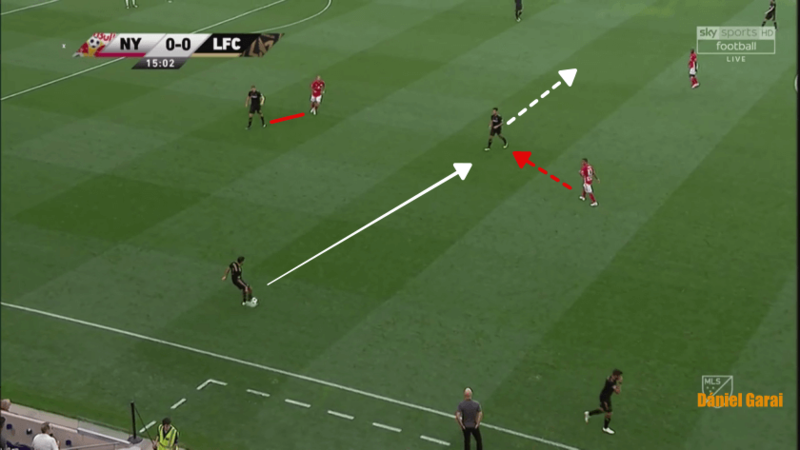 In some occasions were when after bypassing the press LAFC passed to Vela, who dropped to the halfway line in these situations. 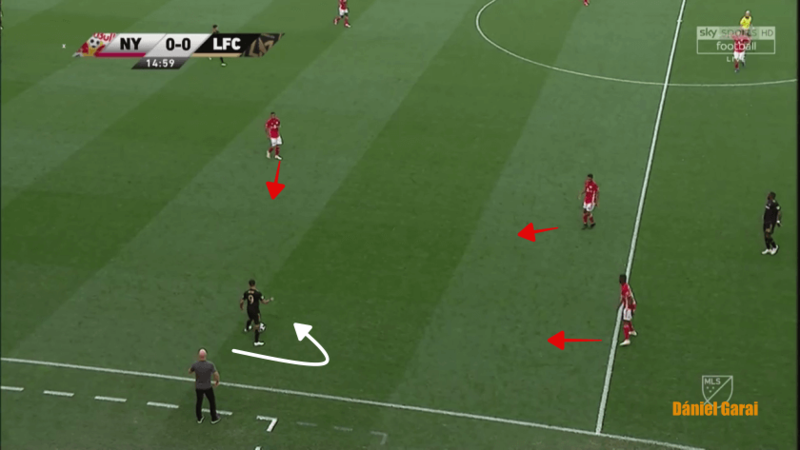 Then right after he got the ball he switched the side with a diagonal pass towards Blessing on the left wing. Both teams showed some strong aspects of their game and some weaknesses, thus both need to develop especially, LAFC. In the end, NYRB won with a late goal, but with a superb counter-attack, which praises the quality of the players. In overall, we have seen 3 goals, which is above the average 2 goals that I discussed earlier, but if we think that both teams have two goals per game stat then we would expect more. However, NYRB keeps their record of conceding the only goal per game.